Life does get in the way sometimes. Couldn’t write this on Friday because we were at the hospital enjoying the arrival of our 12th grandchild. She is a little delight but she is already making our life interesting as she stays in the hospital for a few days leaving us the rather tiring joy of taking care of her two older brothers. Autumn, of course, leaves us with many tasks to accomplish in the garden and I try to find a few hours here and there to work on them. The berm renovation has slowed to almost a halt except for the necessary bulb planting. The picture shows about 50 of the 200 Narcissus that are destined to brighten up that space next spring. I’m now halfway through that 200 and will attempt to finish before the weekend is out. 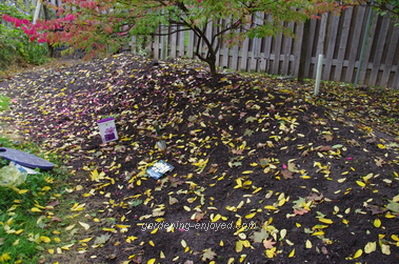 I need to get them in the ground and get some nice deep mulch over them before winter really arrives. The mulch will allow the many varieties of Narcissus to bloom over a few weeks next spring while suppressing most of the weed growth that might want to use that freshly dug space. You can see the box of Blood and Bone meal in the picture and a bit of that goes in each planting hole to supply long term nutrition for the bulbs. It also helps to deter squirrels. The tree rats don’t eat Narcissus but they will dig them up and relocate them to my neighbours garden. He appreciates mine and the squirrels efforts. While we are busy planting bulbs, some of the older bulbs are busy flowering. The Autumn Crocus are appearing all over the yard. They have been planted now for several years and those same Squirrels have reworked my planting plan significantly. 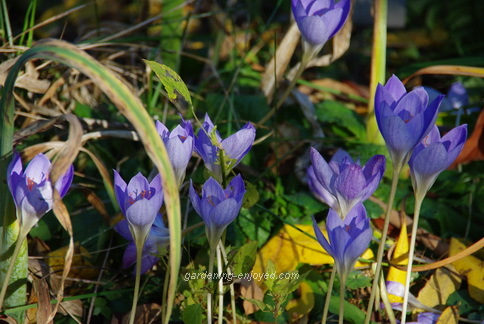 The Autumn Crocus also multiply and spread on their own. They are much smaller but more prolific then the earlier blooming Colchicum that I showed you a few weeks ago. The bright orange stamens in the Autumn Crocus are important for a couple of reasons. There are three of them and that’s how you tell them from Colchicum that have 6 stamens. They have a much more important economic use. The collected and dried stamens form one species of Autumn Crocus are the herb Saffron. I have planted a 100 of them and on my hands and knees collected all of their stamens to produce less then1/2 a teaspoon of Saffron. One such effort will quickly remind you why it is such an expensive item. As I walk in and out of the house these days, I try not to make any empty handed trips. Most of the tender Part Time Houseplants are already indoors but the hardier ones are now asking to join them. 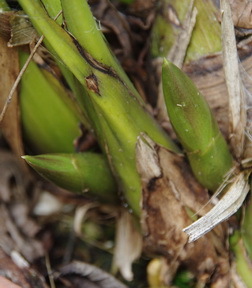 The Cymbidium Orchids like to stay outside until they have had a reasonable cool period to initiate their blooming process. The bright yellow variety is a few weeks earlier then the others and I can identify it by the bloom stalks that are already emerging. The one I carried in today has three large flower spikes emerging and they should provide us with some wonderful blooms in a few weeks. The white ones will follow them indoors in the next week or so, or earlier if they predict a hard frost. Those Orchids will keep the solarium lit up with their amazing flowers for most of the winter. Those blooms more than make up for the weeks of watering and fertilizing their rather unattractive pots of long leaves, all summer. Lee Asks? I am bringing in my hibiscus plants and want to know what I should do to keep them bug free. Ken Answers! I'm not sure a bug free Hibiscus actually exists but we can try to keep the bug population to an absolute minimum. I spray mine,with insecticidal soap, every 2 - 3 days for a week or so before I bring them in an attempt to bring in as few bugs as possible. Once inside I just monitor them as I water them and spray as needed. I wish we could get the predators in small quantities to use at home. Laurie Asks? I enjoy your blog very much and appreciate the time it must take to do it and garden. I recently pulled some begonias - “Santa Cruz Sunset” and found some rather large tubers. Can they overwintered and can they be divided? Also my virginia creeper has a lot of dead branches in the centre. Can it be cut back to say 3 feet and be regenerated? Ken Answers! Yes those Begonia tubers can be overwintered in a cool location 50F would be ideal but mine do just fine a little warmer. Start them up again about mid March. I have never tried to divide them but if you are going to try wait until they have just started growing so that you can be sure to get a growing point on each piece. The V. Creeper should have no trouble growing back from such a pruning. Za Asks So, what's the yellow & white Iris called from the last Dallying? Ken Answers! One of my many failings is my inability to keep proper labels in place. I have no idea what that Iris is called. The label is either unreadable or has gone for a walk.